The year 2002 marked the opening of three new stadiums in the NFL, including Ford Field, home of the Detroit Lions. In 1975 the Lions left Detroit, moving to Pontiac, MI and the 80,000 seat Silverdome. The Lions played there for over two decades before wanting a new stadium in the mid 1990s. By 1995, the Lions began discussing the possibly of moving back to Detroit because the Silverdome had become economically obsolete. On August 20, 1996 the Lions, owned by William Clay Ford, announced plans to build a new domed stadium in downtown Detroit. In November 1996, voters approved a referendum that paid for 51% percent of the football stadium, while the team paid the remaining 49% of the $500 million stadium. The Lions football stadium was built as a sports entertainment complex that also included Comerica Park, home of the Detroit Tigers (MLB). 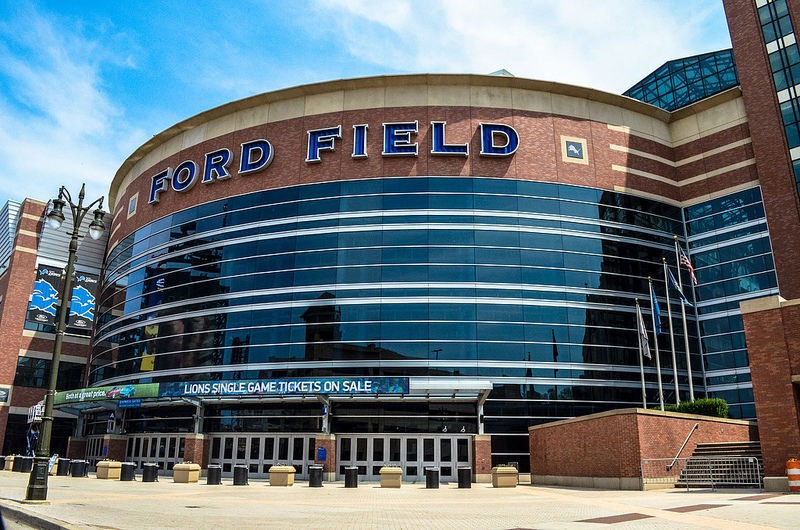 Ford Motor Company purchased the naming rights to the stadium for $40 million over 20 years, therefore the stadium was named Ford Field. Construction began on November 16, 1999 and was completed in 2002. Barry Sanders rushes for 2,000 yards in 1997, winning the NFL MVP. On September 22, 2002, the Detroit Lions played their first game at Ford Field against the Green Bay Packers. Ford Field is one of the NFL’s most unique stadiums. It has 65,000 seats and has a fixed roof supported by two 18ft-wide concrete columns. A structural-steel supported permanent dome was chosen to cover the facility because of Detroit’s cold and harsh winter weather. One of the unique aspects of Ford Field is the entire south wall of the stadium is made of the 1920s Hudson Warehouse. The building was renovated to include 132 luxury suites on three levels facing the playing field. It also includes retail shops and restaurants. When one thinks of a dome stadium they do not expect to see any outside light inside. However Ford Field incorporates lots of glass allowing natural light inside. On the south entrance of Ford Field is a six story glass atrium that gives fans tremendous views of downtown Detroit’s skyline. The FieldTurf playing field is 45 feet below street level, allowing fans easier access to their seats. 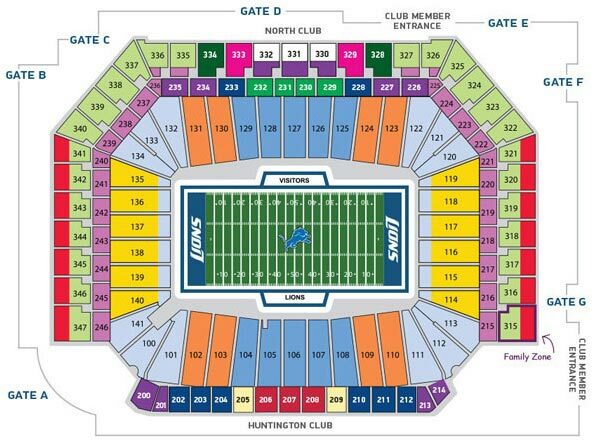 Amenities at Ford Field include 8,600 club seats, 140 luxury suites, a club lounge, banquet rooms, conference and convention areas and a Lions team store. Other than being the home of the Lions, Ford Field hosts many other events. The facility was the site of Super Bowl XLV in 2006, the NCAA Basketball Tournament in 2008 and 2009 and the Frozen Four in 2010. On December 13, 2010, Ford Field was the site of the Minnesota Vikings/New York Giants game after the Vikings home, the Metrodome, collapsed. 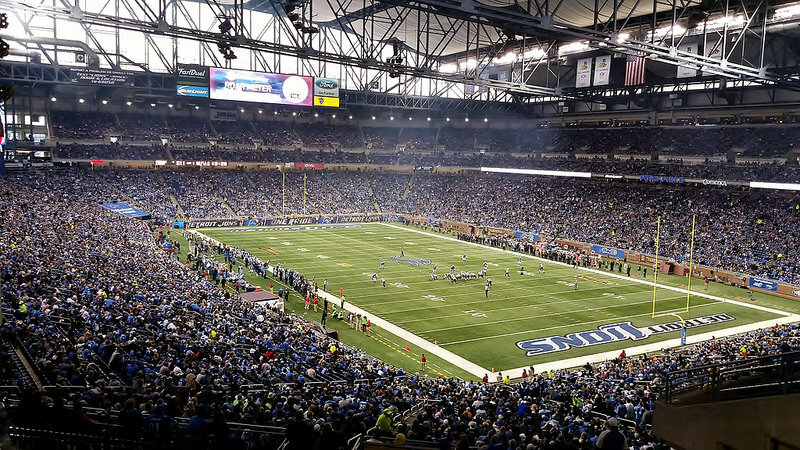 Prior to the start of the 2017 season the Lions completed a $100 million renovation project at Ford Field. The most striking change noticeable to fans are the new HD videoboards in both endzones that measure 39.5 feet high by 152.5 feet wide. All of the concourses were been updated to provide a more football themed look, a new 90-foot long bar, named the “Corner Bar” was added and is reminiscence of bars one found new the Lions old stadium, Tiger Stadium, and a number of new terrace club and suites were added around Ford Field.